Thread: So, I bought a Mtn Bike!!!!!!! 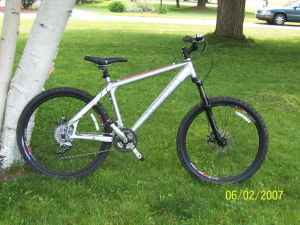 I bought my first mountain bike tonight.....and im pretty stoked to use it. Its a 2005 (or 06) Jamis Komodo 1.0 with a bunch of upgraded components. Was upgraded to Shimano XT dérailleurs, XT shifter/brake levers, 9 gear rear, XT front crankset and Avid flakjacket cables. Barely ridden and never offroaded or downhilled. Also has Duro front shock and Tektro mechanical disc brakes. This isnt the best pic.....I can take more tomorrow with my camera. I dont know if that is the way you are setting it up but if it is it looks way to big for you. well, I felt fine riding it.....and the guy I bought it from is the same size as I am. So, now with your own bike you'll kick our old butts even more than before?? I heard you bought a new bike as well!